Home MXR M-101 Phase 90 Sale! 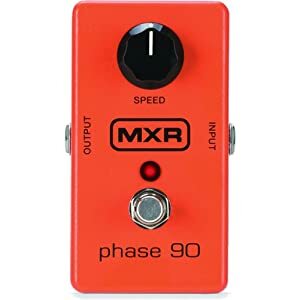 MXR M-101 Phase 90 Sale! I’ve seen this happen from time to time.. and now it’s happening again. There is a great deal on the MXR M-101 Phase 90 happening on Amazon right now. The MXR M-101 Phase 90 lists at $150, usually you see it available in the $80 range, but is currently on sale for $62.20 and is eligible for FREE super saver shipping. This is great price to pick up a very classic phaser. At the time of this post, there were only 5 left in stock, so you’ll need to jump on it if you’re interested! The MXR Phase 90 delivers the classic four-stage phasing sound with continuously variable speed control. The Phase 90 has a fixed regeneration level that adds intensity and sounds great on guitars and keyboards. Uses batteries or ECB03 power supply. The MXR Phase 90 has found its way into many of Eddie Van Halen’s recordings, adding a shimmery velocity to lead passages or a more dramatic swoosh to muted strumming. This phaser is not just designed for guitars; it works well with bass, keyboards and even vocals and appears in all of these guises on Dweezil Zappa’s Z album, ‘Music For Pets’, which hints it is flexible and hip. Again, the MXR M-101 Phase 90 is on sale for $62.20 at Amazon.com! Nice Deal on MXR M-101 Phase 90 at Amazon Stellar deal on the MXR M-101 Phase 90 at Musician’s Friend Good price on MXR Phase 90 Great deal on MXR Phase 90 at Music123! Awesome deal on the THD Electronics Quintet Pedal Quintet Tone Curve Pedal at AmazonMusician's Friend Memorial Day Weekend Sale Coupon Code!